When many chemists are asked what is the 2JH-H coupling for compounds like methane, acetone, methylene chloride, dimethyl ether or DMSO, they will often return a look of confusion. "There is no coupling," they will say, "the proton spectrum is a singlet". 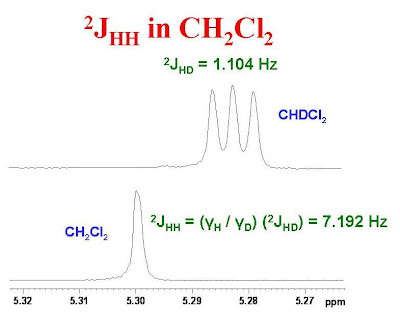 Indeed the proton spectrum is a singlet for these compounds but 2JH-H is not equal to zero. The only reason that the coupling is not observed in the spectrum is because the chemical shifts of each proton are identical. The coupling can easily be measured by observing the spectrum of a partially deuterated isotopomer. The 2JH-H coupling constant is equal to 2JH-D multiplied by the ratio of the gyromagnetic ratios of 1H to 2H. This is illustrated in the figure below for methylene chloride. In fact, 2JH-H is -7.192 Hz not +7.192 Hz however, this cannot be determined simply by observing the spectrum. Both spectra were measured for dilute solutions with CDCl3 as solvent. The residual protons of CDCl3 were used as the chemical shift reference (7.26 ppm). The chemical shift difference between CH2Cl2 and CHDCl2 is due to an isotope effect. It should be noted that the indirect way of how you deduce the scalar coupling between the nuclides of an equivalent group, while correct for an estimate, can be affected by a J-coupling isotope effect (theoretically, those may be quite significant, I believe). If one wants to be accurate and backed-up by experiments, there just does not seem to exist any way to determine the values of those unobservable couplings. Thank you for your comment. I have never thought about how significant an isotope effect might be on a coupling constant. In order to evaluate such an isotope effect I suppose one must look at more than one isotopomer of a suitable compound and measure the couplings constants. 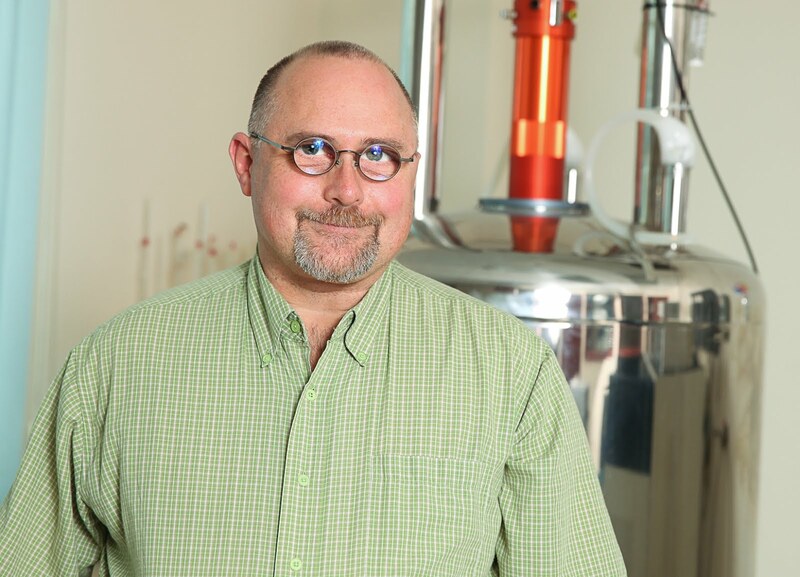 Cynthia Jameson has a good article on isotope effects on spin-spin couplings and shieldings in the Encyclopedia of NMR. There is a primary effect (the one you have been discussing) and a secondary effect where isotopic substitution somewhere in a molecule affects the coupling observed between two other nuclei. Great blog! It has been my go to for NMR questions. I am still struggling with concept of why magnetically equivalent protons don't produce a splitting pattern. Two isolated methylene protons, for instance; each has the potential to be spin up or down. So why, in the absence of chirality, do we not see a doublet of doublets? I think that technically there is a dd, but the inner peaks of the dd overlap, and the outer peaks are so small they are unobserved, but I guess I don't really understand why that is. All magnetically equivalent nuclei (for example all three protons of a methoxyl group) are isochronous and will therefore give a singlet. I know that this is not much of an answer. I am given to understand from Adam's question followed by Glenn's clarification that one can not give a common statement "magnetically equivalent nuclei doesn't couple" though we observe singlet because of comparable chemical shift and J values. But my doubt is, magnetically equivalent protons always give singlet, should I proceed unequivocally without exception ?? Second one is magnetically non-equivalent proton nuclei in 1,4-substituted benzene case (the two ortho protons in some compounds magnetically non-equivalent considered) , how to understand logically, please explain Glenn !!!! On your first point....Magnetically equivalent nuclei, for example the protons of benzene or the protons in a mehoxy group are indeed coupled to one another however the spectrum is a singlet. On your second point, I would encourage you to look in Robin Harris' book, "Nuclear Magnetic Resonance Spectroscopy" (1983). I find this to be the clearest presentation of the difference between chemical and magnetic equivalence. Thank you very much Glenn for your time and consideration !!! How to find out a coupling constant, whether it is positive or negative value from the NMR spectra? What was origin of this phenomena? I would guess only this is because of spin orientation, but could not able to imagine to figure out the concept. Please help me in understanding this concept. Your question about knowing the sign of a coupling constant is a complicated one. I am certainly not able to provide an answer and I would refer you to the literature. There are instances where one can dttermine the relative sign of a coupling constant compared to another coupling constant by simulating second order spectra or by doing E COSY experiments like this one. http://u-of-o-nmr-facility.blogspot.ca/2010/06/ecosy-and-relative-signs-of-coupling.html .